Power Data Recovery Free Edition for Mac is a Mac data recovery software designed for Mac OS data reocvery. Power Data Recovery Free Edition for Mac is easy to use and provides powerful data recovery modules to help user recover data from Mac computer. It can recover data after accidental deletion, formatted partition, deleted partition and damaged partition. It supports hard disk, external disk, flash disk, memory card, memory stick and iPod. 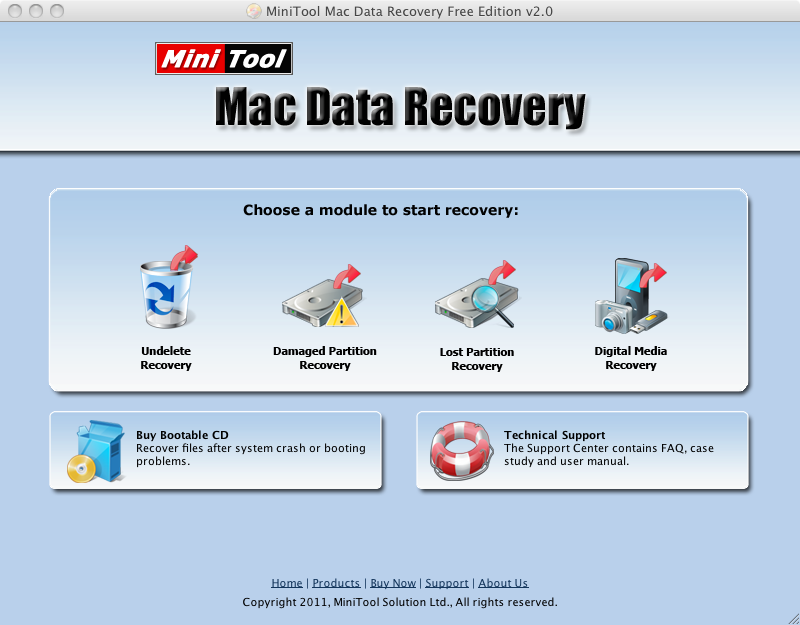 MniTool Mac Data Recovery Free Edition is an all-in-one free data recovery app. Mac Data Recovery Software, MiniTool Mac Data Recovery is an all in one file recovery software for home and business user. It can recover deleted files and folder, restore lost data even the partition is formatted or deleted, restore data from corrupted hard drive, virus infection, and unexpected system shutdown or software failure. Power Data Recovery Free Edition for Mac support IDE, SATA, SCSI, USB hard disk, memory card, USB flash drive and iPod. MiniTool Mac Data Recovery includes four data recovery modules - Undelete Recovery, Damaged Partition Recovery, Lost Partition Recovery and Digital Media Recovery. Each data recovery module focuses on different data loss case. With MiniTool Mac Data recovery 2.0 Free Edition, user can restore lost data up to 1 GB. Qweas is providing links to Power Data Recovery Free Edition for Mac 2.0 as a courtesy, and makes no representations regarding Power Data Recovery Free Edition for Mac or any other applications or any information related thereto. Any questions, complaints or claims regarding this application Power Data Recovery Free Edition for Mac 2.0 must be directed to the appropriate software vendor. You may click the publisher link of Power Data Recovery Free Edition for Mac on the top of this page to get more details about the vendor.